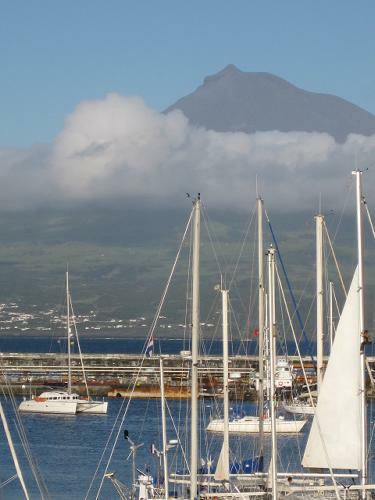 After arriving at Horta, on the Island of Faial in the Azores, we were told there was no room in the Marina so we spent our first couple of days on a dodgy anchorage outside. We anchored and re-anchored numerous times but finally managed to squeeze into the marina on day 3, rafted alongside 4 other yachts. Relief. It has been a week of celebrating landfall – not just us – but every few days another boat of friends arrive – and every evening it is off to “Peter’s Bar” (Café Sport – a yachtie hang-out for at least half a century, its walls hung deep with burgees of visiting yachts) or we sit on the marina wall sharing rum and stories…. 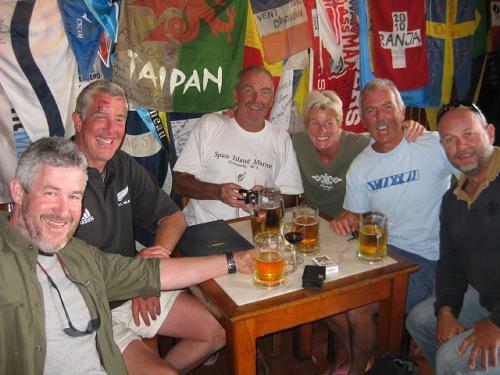 Every boat has obviously had to cross the Atlantic to reach the Azores, so there is many a tale of long, eventful passages …. 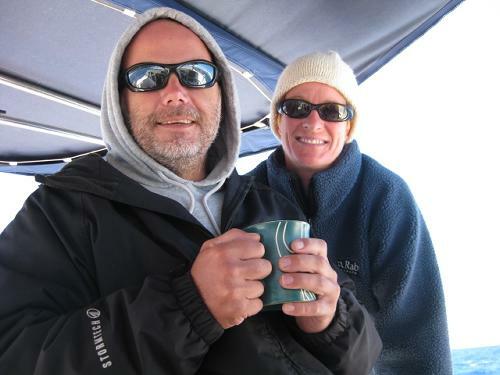 We have also been working on the boat, and exploring the island. 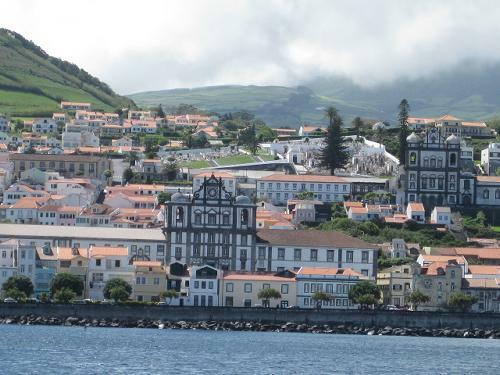 Faial is one of the smaller islands of the Azores (173 km2), the eastern part especially being green and lush, its roads lined with flowers and hydrangeas (hence its nickname Ilha Azul – Blue Island). 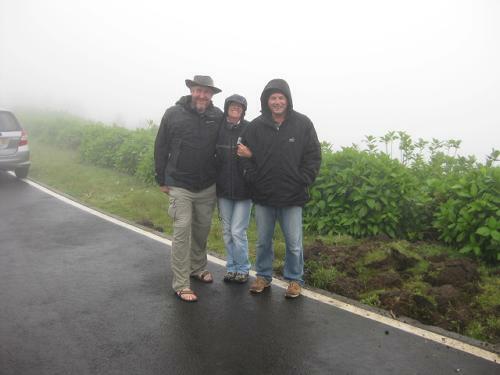 We hired a car for the day to go exploring – we picked the wettest, foggiest day of the week, with nil visibility. 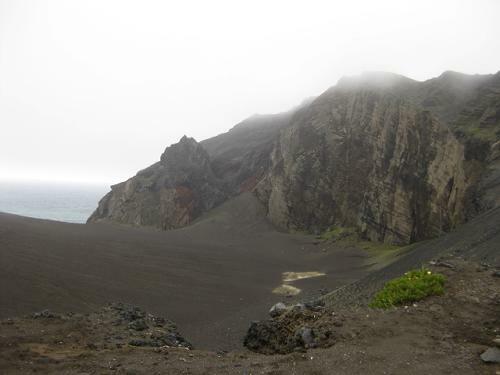 However, we drove all around the island, and spent the morning exploring the sterile volcanic cliffs of Ponta dos Capelinhos in the extreme west – which erupted in 1957-58 leaving a new headland which left Faial 2.5km2 larger. 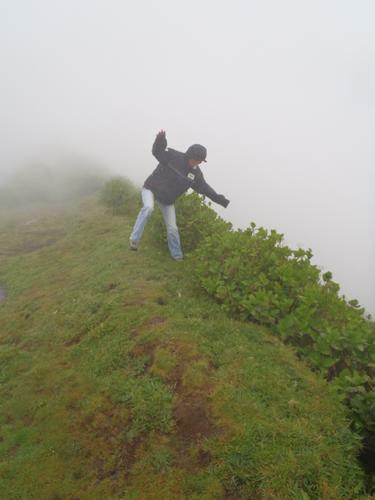 We also drove up to Cabeco Gordo – the island’s highest point, on the rim of Caldeira (1043m), but we were nearly blown into the volcanic basin by strong winds, and were unable to see a thing through the thick fog. 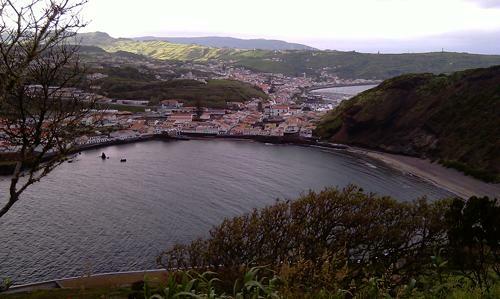 Horta is an attractive long, narrow town, with cobbled roads and mosaic pavements. 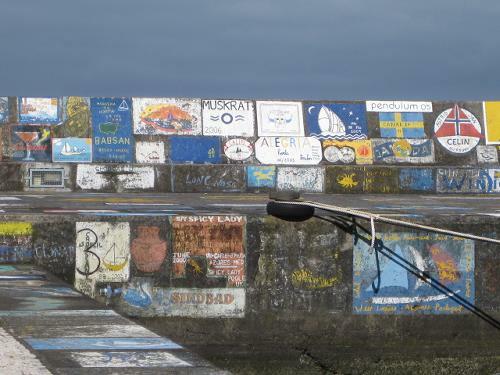 The marina walls are adorned with paintings / insignia left by visiting yachts. 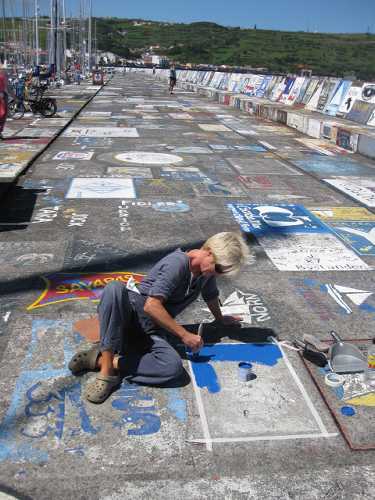 It has been a tradition for decades, and is not only tolerated but encouraged; indeed it’s supposed to be bad luck not to leave your mark. It is a wonderful sight. 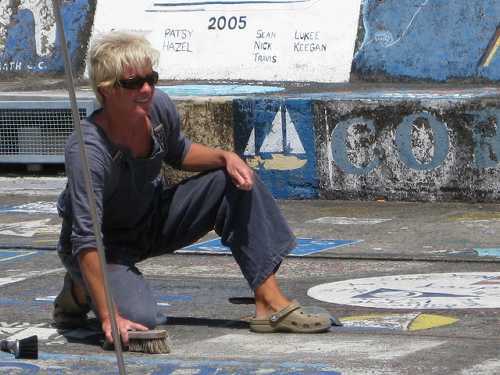 We are in the process of leaving Talulah’s motif …. It is wonderful to be in Europe again! 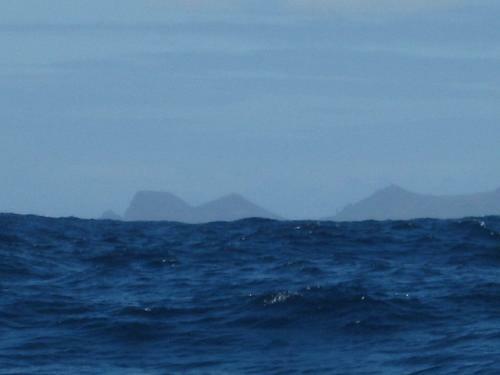 We are thinking of cruising around some of the other islands over the next few days. 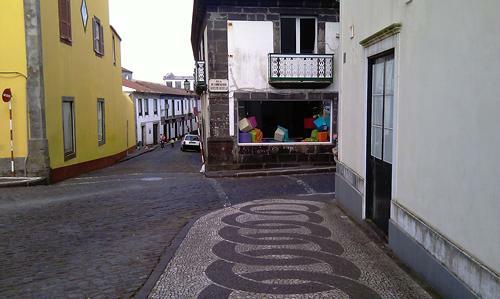 Cobbled streets in Horta – can you spot Shane & Ali??? 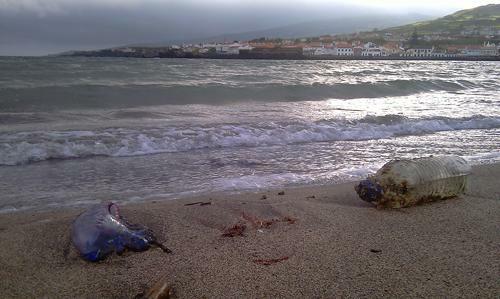 Blue bottle (Portuguese Man of War) and a plastic bottle at their journeys end, at Porto Pim Beach, Horta (Both our constant companions in large numbers while we crossed the ocean). 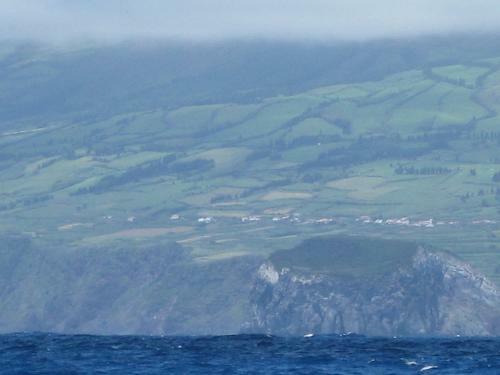 Jon, Ali & Shane doing a drive-tour of Faial on a “beautiful, clear sunny day …” just like Blighty, this.